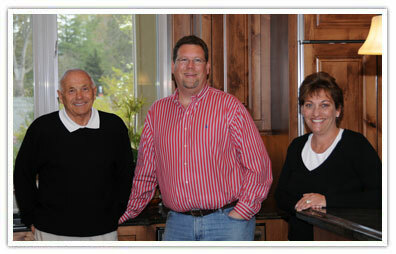 About Us Oregonian Article | Larry Brown Inc.
Two generations build Larry Brown Inc. It's not unusual for extended families to see each other just a few times a year, with Thanksgiving and Christmas tops on the list. But for Larry Brown's family, getting together is an everyday thing; no turkey required. Luxury-home builder Brown sees his three grown children -- 43-year-old Marilyn, 42-year-old Sharon and 36-year-old Scott -- every weekday at work. Though they joined Portland-based Larry Brown Inc. at different times, in different capacities and for different reasons, the next generation of Browns now run the company started by their dad in 1957. Marilyn and Scott purchased the company from their father two years ago, but Larry's still the first one at the office each day, eager to pitch in where he can. "When the kids were growing up, I didn't get to spend much time with them," said Larry, now 76 and recently widowed. At his peak production in the 1970s, Brown said he was "huffing and puffing" to build 26 homes a year. "Now I feel very blessed. I get to see and talk to them every day." Larry even goes to the gym regularly with his daughter Marilyn, with whom he's training for a decathlon. These days, Larry Brown Inc. builds about six homes per year. The houses are upscale, priced from about $700,000 to $1.4 million with high-end finishes and features (see related story, Page H4). Larry Brown houses typically sell quickly and the company has a fan base that includes buyers who have purchased multiple homes over the years. Bob Lovitz and his wife, Laura Mellick, have purchased three Larry Brown homes since 1993 for their growing family: a spec home, a semi-custom home and most recently, a custom home that they moved into three years ago. "We've made a ton of money on the ones we've sold," said Mellick, who credits the quality of the homes more than the strength of the market. "They do great finishes, gorgeous work and they have a knack for putting in windows so you have a great views and great privacy," said Mellick. "We really love the family. They're honest, every detail is taken care of, and they hold your hand through the whole thing." "I'm so proud of the kids," said Larry. "They treat customers with integrity and they build a great home." To date, the company has built nearly 800 homes and rowhouses and developed more than 1,000 lots. To keep afloat during downtrends in the new home market, Larry also invested in apartment buildings, which the company still owns. The company has come a long way from its bootstrap beginnings. At age 16, Larry Brown scraped together $200 he'd saved from his paper-route earnings and purchased a tax-delinquent lot he'd seen advertised in the newspaper. He sold the lot for $500 --making a tidy profit --and caught early-onset real estate fever. After a stint at Oregon State University, where he studied business and building technology, Brown worked for builders and investment companies, buying up land at prices that now seem like pocket change. Brown was 27 before he built his first home, a modest 1,100-square-foot ranch with a one-car garage. He invested $1,500 with another partner. "We sold the house for $10,650," remembers Brown with remarkable precision, looking at a photo of the 48-year-old house and grumbling over the fact that he couldn't fit in a two-car garage. Son Scott, who now runs the construction side of the business, is impressed by his father's recall for such details --as well as his innate sense of how to build a home properly. "Dad can walk in a house, grab a stud and tell me whether it's dry or not," said Scott, who, like most contractors, uses a moisture meter on studs before installing drywall. Scott and his sisters have been around the construction business since they were children. "We swept out houses when we were kids," said Marilyn, not-so-fondly remembering the dusty days before shop vacs. "On Sunday, it was church, brunch, then we'd look at houses or clean up houses," said Sharon. Marilyn went off to college at Santa Clara University and spent 10 years in the Bay Area in commercial real estate. "I had no intention of coming home, but I decided it was time for a change. Dad said, 'Why don't you try it for a year?' I came home in 1991 and I really liked it." Marilyn's role is to find land to purchase, work on house plans, subdivision development and interiors. A broker, she also sells the homes, putting to use her degree in real estate and marketing. Her brother held out a little longer from joining the family business. When he was younger, Scott said, "Dad would ask me all the time, 'Do you want to build homes?,' and it was an emphatic 'No!' I wanted to build race cars." After high school, he followed his big sister to Santa Clara University and got a mechanical engineering degree, then worked at an engineering firm for three years. Everything changed in 1994, when Larry fell ill. Scott was about to get married in California, but he left his fiancee behind to come help his dad for awhile. After they were married, Scott and his wife moved back to Oregon, and Scott joined the company for good. Sharon, meanwhile, attended the University of San Diego and moved to Seattle, where she worked as a manager for Northwest Airlines. She moved back to Portland in 2000 and joined the family business, where she manages the apartment properties. The three siblings cherish the time they get to spend with their dad, especially since their mother, Dori, died this summer. And Scott has come to love the home-building business he scorned in his younger days. "This is what I do," said Scott. "And I take a lot of pride in what I do. I can't cut corners. This is my art." "My business philosophy," said Larry, "is one, to build a good home; two, to try to have a satisfied customer; and three, to try to make a profit. If you do it in that order, it'll take care of itself." Kendra Hogue, editor of Sunday Homes & Rentals, can be reached at 503-221-8318 or kendrahogue@news.oregonian.com.